Volunteer project: The project aims to celebrate and raise awareness of South Africa's art and culture, history and communities. The group will be tasked with general hands-on activities such as art sculpture cleaning, ground maintenance, painting and general care of the area. Volunteers will have the opportunity to learn about local music, traditional dances, historical icons, making of sculptures. They will also share cultural activities, make beads and learn about South African history and communities. Volunteer profile: No previous experience needed. Volunteers are expected to be open minded, ready to interact with people of different cultural backgrounds, positive and willing to share their experiences, flexible to live/stay in simple living conditions and eat local food, ready to do manual work on the project. Leisure time: Weekends are meant for free tours that the group can organize by themselves. There will be also cultural nights when each volunteer can present their country and culture. Accommodation: Accommodation will be in Fountains Valley camping grounds, in tents of the nature reserve. Participants are required to bring their own sleeping bags. There is a simple common bathroom with showers and running water. There's no electricity at the accommodation and the work place. Location: Fountains Valley Park, Pretoria. The community is multi-cultural and English is mostly spoken along with local languages such as Sotho, Zulu and Tshwana to name a few. Volunteer project: The project provides a platform in recognition of Youth Day events of June 16th and the role that youth plays in South Africa's society. Sports and cultural activities will be held and international and local participants will take part in the activities together. This is an exciting project as volunteers will have the opportunity to work with different communities and interact with children after school. The program will require volunteers to be involved in sports and cultural activities. They will also design learning activities which will be used when the volunteers meet the children for daily activities from 8am to 4pm. Volunteers will work in groups. Volunteer profile: No previous experience needed. Volunteers are expected to be open minded, ready to interact with other people of different cultural backgrounds; positive and willing to share their experiences; flexible to live/stay in simple living conditions and eat local food. Leisure time: Weekends are meant for free tours that the group can organize by themselves. There will be also cultural nights when each volunteer can present their country and culture. There may be some weekend excursions with students to different areas of Pretoria. Accommodation: Accommodation will be in a house in Soshanguve. Participants are required to bring their own sleeping bags. Location: Soshanguve, Pretoria. The community is multi-cultural and English is mostly spoken along with local languages such as Sotho, Zulu and Tshwana to name a few. Volunteer project: The Sports development program requires volunteers to be involved in different sports activities such as simple sports and games activities. Volunteers will interact with children and teach them sports and artistic activities. The volunteers will be able to interact with the community too. This is an exciting project as volunteers have the opportunity to work with different communities and interact with children in sports development and will also have the opportunity to be hosted by local families for the period of their stay in the country. 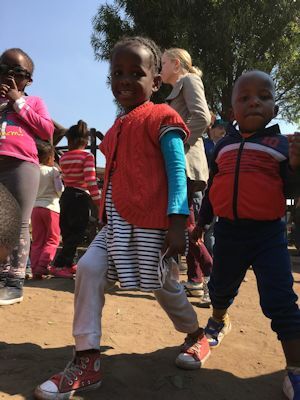 Volunteer project: Volunteers in this project will help provide support and care to orphans and improve their emotional state and their level of acceptance through daily routines at either one or two orphanage homes in Laudium or Atteridgeville near Pretoria. The orphanages provide a caring environment for children that are at their most vulnerable (children living and working on the streets, child headed households due to the HIV/AIDS pandemic, abandoned babies and toddlers). Their mission is to render services and programs that are in the best interest of each individual child. 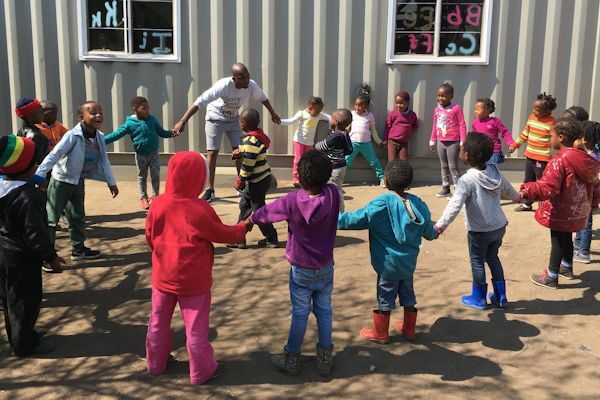 The main focus currently is to create better opportunities for the children to develop in a stable and caring environment, and to improve their life skills. The children attend regular workshops on various topics including hygiene, health matters and ethics amongst others. The children have an abundance of talent. They have violin classes, they are great chorists and are excellent gumboot dancers. Music is a great way of teaching the children about life, and also provides them some escape from their own experiences. Volunteers will get involved in first hand activities such as baby minding, cleaning the home and other activities as needed. They will also run a multi-cultural exchange program for the children with the help of art, music and dance. Child Abuse is rife in South Africa and unfortunately not nearly enough is being done to protect the children. Abuse and poverty are the main contributing factors to street children and abandoned baby statistics in the country. Volunteer profile: Volunteers are expected to be open minded and the Doer type, ready to stand out in front of the others and coordinate the children. Any knowledge of musical instrument, singing or dancing is highly welcome. Accommodation: Accommodation will be in rooms at the center. Participants are required to bring their own sleeping bags. Location: Attridgville and Laudium, Pretoria. The communities are multi-cultural and English is mostly spoken along with local languages such as Sotho, Zulu and Tshwana to name a few. Volunteer project: The aim of the project is building a strong cultural identity, common heritage, shared values and ethics with youth and African history celebration. The Heritage celebration will require volunteers to be involved in arts and cultural activities such as learning local South African arts and cultural activities and sharing their own culture and values from their respective countries. Volunteers will work in groups and will be able to share each day and cook their local traditional food and teach children cultural and artistic activities and games. This is an exciting project as volunteers have the opportunity to work with different communities and interact with children in cultural and arts activities. Leisure time: Weekends are meant for free tours that the group can organize by themselves. There will be also cultural nights when each volunteer can present their country and culture. There may be some weekend excursions to different areas of Pretoria. Accommodation: Accommodation will be in a hall in Pretoria. Participants are required to bring their own sleeping bags. Location: Pretoria. The community is multi-cultural and English is mostly spoken along with some local languages such as Ndebele and Zulu. Volunteer project: The Gardening Project is a community led initiative to encourage young people to promote low environmental impact living and eco-friendly practices. The emphasis is on sustainable living and environmental awareness of climate change. Volunteers will have an opportunity to get hands-on training from relevant training personnel from the Department of Agriculture and also some community based organisations. The group will visit an informal settlement where various activities will be carried out. Accommodation: Accommodation will be in a home in Pretoria or Johannesburg. Participants are required to bring their own sleeping bags. Location: Pretoria or Johannesburg. The community is multi-cultural and English is mostly spoken along with some local languages such as Ndebele and Zulu. Volunteer project: This project takes place in three countries - Zimbabwe, Lesotho and South Africa. Soccer is a very special sport since it crosses all the boundaries of language, culture and geography. While almost everyone on this planet knows of, plays or has watched others play soccer, aside from goals scored and long-standing team rivalries, rarely do we hear about the more important value and ability of this and other sports to effect positive social change. This initiative aims to utilize “soccer power and influence” to keep young men and women engaged meaningfully in the community and increase their ability to deal with various challenges affecting them including poverty, drug addiction, HIV/AIDS endemic, etc. • Organize the final competitions and awarding. Special requirements: No special or particular expertise/skills required. However a potential participant for this project should be open minded, flexible, ready to learn and adapt to other cultures, interested in physical/outdoor activities, sports, youth, and able to work under less supervision and minimum resources. Leisure activities: Exploring Pretoria's historical, natural and cultural sites including museums, local markets, etc. Enjoying wildlife and marine life. Kruger National Park, tour to small animal reserves, variety of water sports, among many other options. Accommodation: Volunteers will be accommodated in a communal house in the community, in shared rooms. Location: The project will be hosted for the first two weeks in Harare, Zimbabwe, next two weeks will be hosted in Mabopane-Gauteng, South Africa and the last week in Maseru, Lesotho. South Africa: Mabopane was proclaimed in 1959 as a black-only residential settlement by the then Transvaal administration. Before its proclamation the area was under the administration of Transvaal government little more than grazing lands with small communities in Boukenhoutfontein (which later became Block A), Winterveldt and Hebron. The initial residents of Boukenhoutfontein were victims of forced removals from Wallmansthal, Lady Selborne, Boukenhoutkloof and other farm areas around Pretoria. Other residents of Mabopane were Mapulana people who were evicted from the farms near Primier Mine and settled in a non-developed area commonly called Mapulaneng, which is between Block A, Lebanon and Block U. With the financing coming from the South African government the first block houses were constructed similar to those found in Soweto beginning with Block A which had two roomed houses, Block B, Block C, Block D and Block E. The areas within Mabopane were planned according to the class of its citizens; for example Block D (with many mansions which housed the politically connected) in comparison to Block E (block–houses). Volunteer project: The project activities will include community service in and around Pretoria and social work at an orphanage and old people’s home. This project is held in recognition of International Volunteer Day - December 5th. The main focus is to pay special tribute to volunteers' participation in making a difference locally and globally. It is a unique chance for local volunteers who contribute their time to bettering the Pretoria community to celebrate their efforts, share their values, and promote their work among their community and the international group of volunteers. Giving local South African volunteers the opportunity to celebrate with people from different countries and cultures is an incredibly meaningful way to appreciate and honor their contributions. Accommodation: Accommodation will be in a home in Pretoria. Participants are required to bring their own sleeping bags.